Date – 23rd March 2018. Location – 29 Francis Street, Derry-Londonderry. 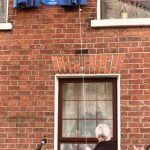 Unveiled by – Cathal McCabe, grandson. 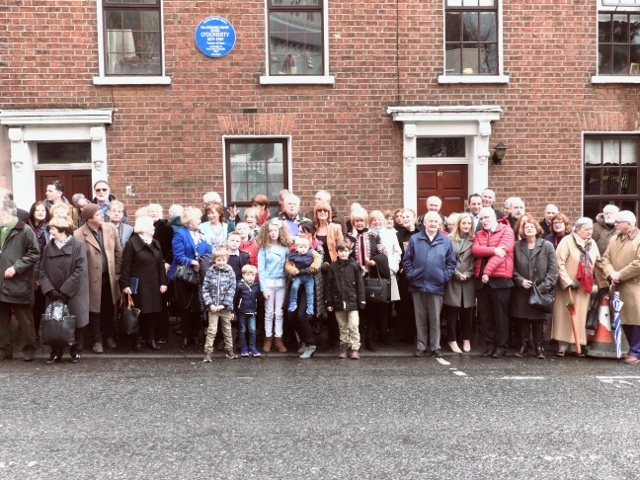 The second plaque in the five year Ulster History Circle partnership with Derry City and Strabane District Council was unveiled by television and stage producer, Cathal McCabe who had travelled from Dublin to unveil his grandmother’s Blue Plaque at the house where she lived. 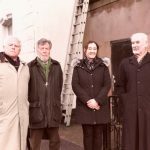 Behind St. Eugene’s Cathedral in the City, in a street that could well be renamed ‘Music Street’ (James McCafferty, founder of the Gaelic Singers lived at No.25 and the late great Joseph Locke also lived close by), a large crowd of guests heard Chris Spurr, Chairman of the Ulster History Circle, say that the contribution made by Mrs. Edward Henry (Rose) O’Doherty to the music of the City and its Irish Culture, was immeasurable. Rose, as a music teacher and one of the co- founders along with Father McGettigan of the Feis Doire Colmcille in 1922, remained involved in her music and the Feis Doire now in its 94th year, until she died in 1969. Thousands of young people and adults have travelled through its doors and some have become household names throughout the world, to name but a few, Phil Coulter, Dana, Roma Downey, and the Undertones. the Archbishop of Armagh and Primate of All Ireland, and a native of Derry, Dr. Eamon Martin, was read out by Pat McCafferty, the musical director of the Feis Doire Colmcille. The Archbishop served as the Executive Secretary of the Feis in the 1980’s and 1990’s. 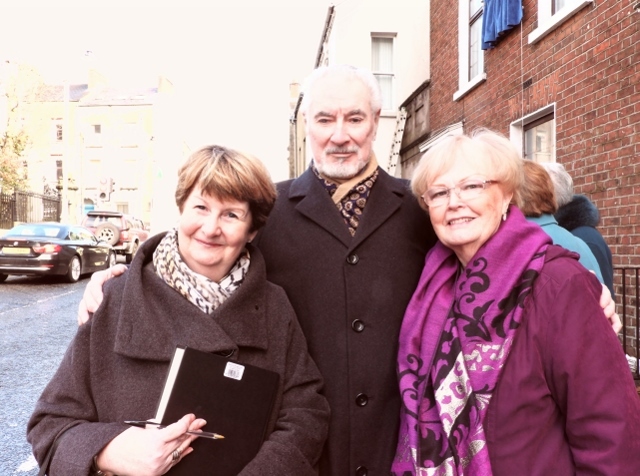 Before unveiling the plaque to his grandmother, Cathal McCabe spoke of his memories of the lady whose love of music continued through his own musical career. Guests then adjourned to the Tower Museum for refreshments and to listen to further tributes from family members, and a poetry reading by two young girls aged six and seven who had already participated in the Feis. Musical tributes were from the well known singer Maureen Hegarty, and by St. Patrick’s Primary School, Pennyburn, where another of Rose’s grandchildren, Eamon Devlin is headmaster. In 2013, the school won the BBC Junior Choir of the Year. 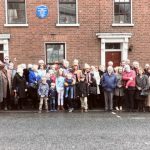 A long remembered, wonderful day in the Maiden City, honouring a very special lady, known throughout the Island as Mrs. E.H. O’Doherty. Click on the photos to enlarge image. 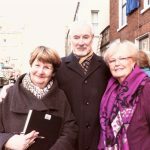 Mairead Ferguson, treasurer Ulster History Circle, Cathal McCabe, eldest grandson of Mrs. E.H. O’Doherty, and singer Maureen Hegarty. 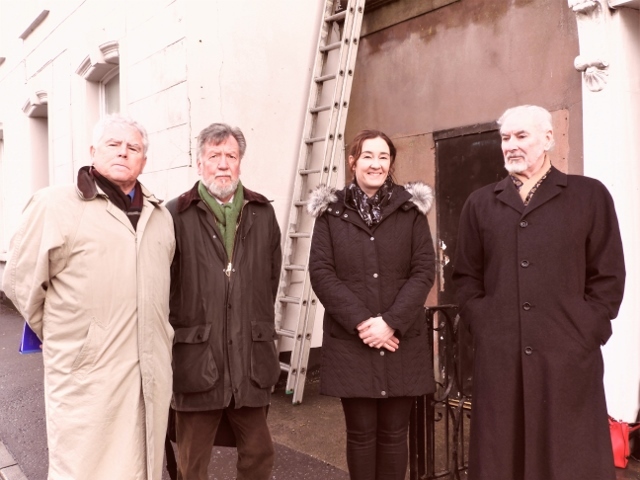 l.r.-Pat McCafferty, Feis Doire Colmcille, Chris Spurr, Chairman Ulster History Circle,, Roisin Doherty, Curator, Tower Museum, Derry-Londonderry and Cathal McCabe. 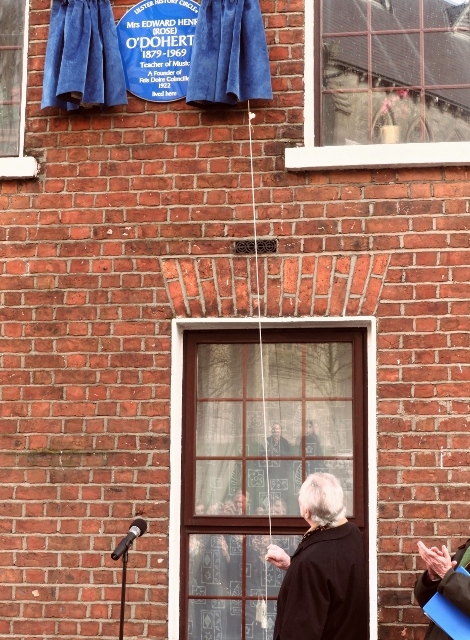 Cathal McCabe, unveils the Blue Plaque to his grandmother, Rose. Family and guests gather in front of No. 29 Francis Street, Derry-Londonderry after the unveiling.